How did the favorites fare through pool play? WATERLOO, ON — A fresh slate of teams arrived in Toronto to compete at WJUC 2018. Instead of filling out pools with the usual list of small European teams, the Canadians are hosting first time participants from Mexico and the Dominican Republic in the Americas, and Hong Kong and the PRC in Asia.1 They’ve all come to the beautiful fields at Waterloo, about an hour west of the city. On the girls’ side, the tournament structure divided them into two pools. Reigning champions, Canada, sit atop Pool A, with France, Germany, Australia, Great Britain, and in a surprising seeding move, Colombia and the Cardenas sisters. On the other side, the United States shares a pool with New Zealand, Netherlands (2017 European U20 champs), Italy, Japan, and the new Mexican and Chinese teams. At the week-long tournament, the teams spend three days in pool play, then a day of power pools, with the top three teams in each pool advancing, and the top four teams in power pools going directly into semifinals. The tournament opened with a showcase match between Canada and Germany.2 The hosts came into the game as the clear favorites, but the girls from Germany intended to crash their party. After having her legs chopped out from under her on a hard Canadian bid, Ava Mueller led a patient German horizontal offense to keep the game on serve until just before half. By early in the second half, though, the home team had taken the game firmly in hand. Led by #7 Brittney Dos Santos, Canada cut its way through the first couple of days with an athletic style of play that emphasized constant motion and the give-and-go. Whether because of fatigue from playing at the Canadian Junior championships the previous week, though, or because the largely new roster is still gelling, at times it looked rushed rather than deliberately uptempo. Overall, it looks like the Canadians still have work to do if they want to repeat as World Champions. Australia and Great Britain rounded out Pool A. While the boys’ scene is strong in GB, historically the girls’ has lagged well behind, so the team has struggled. This year’s version is something of a restart, after disbanding last year and missing the European Championships. Coming through the country’s new girls’ program has made the team tighter, but for 2018 at least, younger than most of the top teams. While they didn’t managed to win any games in pool play, they have been putting up good fights, led by Leah Atkins and Becky Parsons. Australia, on the other hand, looks like a team a few years further down the program curve from the British. Led by Holly Reeve, one of the tournament’s assist leaders so far, the girls from down under are landing solidly in the middle of the pack, putting up big numbers against the weaker teams, but losing to the top ones. A close loss to Germany may keep them out of the bracket, but they’ve been doing well. Meanwhile, across the schedule in Pool B, Team USA came out of the gates like a V8 Charger with water in the gas. Their speed and power were on easy display, but sometimes it looked like they’d press the pedal and nothing happened; too often cuts didn’t occur when the handlers expected them, and too many open cuts were looked off because the handlers weren’t ready. One team that had hoped to beat Team USA was Japan. 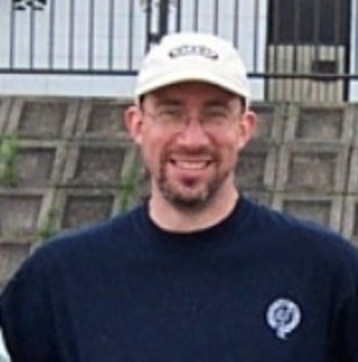 Over the past two WJUC cycles, the JFDA has established a sustained youth program in Tokyo that competes at adult tournaments and gives the national team a deeper pool than the first year college students they previously relied on, producing players like Miri Matsuzaki, who leads the tournament in assists at just age 17. Their first game was against New Zealand. The Kahu girls had been training together since January. Located far from other competition, they play the Australians in a Trans-Tasman series on odd years to keep in international form. It didn’t take long to spot New Zealand’s strategy: throw a high ball to tall Zoe Risner in the middle, and let her power the disc deep to one of the team’s other receivers, preferably Helena Cvitanovich, whose acrobatic catching ability was crucial to their scores against the U.S. as well. In a surprise development, though, Japan came out firing deep as well. Eschewing the patient short game of inside breaks that Japanese women’s teams usually use internationally, the U20 team comparatively tended to shoot deep and shoot often. According to team staff, the switch wasn’t planned in advance, but something they had ready in case opportunities appeared. Whatever the cause, the new tactic worked, even against taller teams like New Zealand, because of Japan’s team speed. When their throwers could get the disc out in front of the receivers, their ability to get to the disc first made it almost impossible to stop. The only team to stop them in the first two days of pool play was the USA, who could run with them stride for stride. If the Japanese throwers had stayed current on Ultiworld’s youth coverage they would have known that one does not simply huck against Ella Juengst. In any case, from the no. 8 seed, the Japanese girls sprinted up the ranks in Pool A. Another team with high ambitions was Netherlands, who brought the skill and athleticism that propelled them to their 2017 European championship. Four stars from the Dutch mixed team Grut that competed at WUCC are still young enough to play on the U20 team: Lola Dam (the division’s leading scorer by a significant distance), Anne Minnaard, Janne Jansen, and Floor Keulartz, an absolute beast in the air whose shoulder-high layout against Italy has to be one of the best in the entire tournament, if not the best. Nevertheless, opening day jitters hit them hard, and they lost their first game in an upset to Italy. The bottom two teams in Pool A were Mexico and the People’s Republic of China. While the French parents may have been more organized, the Mexican parents took home the prize for best dressed, with flag capes in abundance, and the Masked Avenger prowling the sidelines cheering his team on to greater ferocity. The Mexican team was led by Wilhelmina Graff. Her on-field decision making was surprisingly good, avoiding the low-percentage shots that so many of the weaker teams depended on. Against the tight American defense in their first game, that style made it impossible for the Mexicans to advance it far downfield, but against other teams in the pool, it generated respectable scores for the WJUC newcomers. The PRC team turned out to be a Shanghai-based team, made up of girls who had learned the sport at an international school there, or while studying at a foreign university. They had played together against adult teams at the Shanghai Open, so they did have some competition under their belt before they came to Canada. Once here, they were joined by a couple of pickups, including Grace Conerly, fresh off a YCC Girls’ U20 championship with the NC Warhawks, and who provided the team with some impressive deep throws. Unlike most other teams, the PRC team played zone as their primary defense; they had a surprisingly quick cup, but one whose spacing made me wonder if maybe Chinese meters are shorter than traditionally measured. By the end of play Monday, the tournament storylines were beginning to come clear, but it would take some big games on Tuesday and Wednesday to flesh them out. A storm front rolled through Monday night, bringing rain and threats of lightning that caused the organizers to cancel all Tuesday afternoon games and pushing pool play back through Wednesday afternoon. Before the players could get back to their dorms, however, they faced showdowns at the top of each pool. From the very first point, the match between the United States and Netherlands shaped up to be the best game of the tournament so far. After their inexplicable loss to Italy in their first game, the Dutch girls were determined to recover lost ground and make the bracket. Both sides played a clean game, with few turnovers or calls on either team. It opened with a Dutch hold, the first early score against the U.S. National Team in the tournament. The Americans responded, and the game seesawed back and forth until halftime, with each team getting one break early. The Americans took half with a break from Caroline Tornquist to Hazel Ostrowski. As the second half began, the Dutch sideline looked aflame with excitement in their orange uniforms. Only one point down on the USA with plenty of time to play, they sensed the possible upset. Fueled by Keulartz’s athletic defense, the Netherlands broke again to tie the game at 12-12. Throughout, Dam was unstoppable on offense, beating top American defenders and scoring five points in the second half alone. On double game point, the U.S. started on offense, but a bobbled catch escaped Claire Trop and gave the Dutch the disc 20 yards out. As a nervous U.S. sideline looked on, intense defense forced the Dutch into an arching crossfield hammer. Bent on redemption, Trop exploded forward from a deep poach, knocking it out of the air and sprinting for the end zone without looking back. 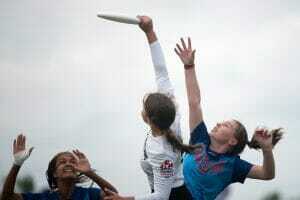 Three throws later, Stephanie Phillips rewarded her with the disc and the victory. Even in a tearful defeat, it’s hard to imagine the Dutch not advancing deep into the bracket. Meanwhile, on the showcase field, Canada and Colombia faced off in a much-anticipated battle of the top two seeds in Pool A. Both teams play an entertaining run-and-gun style, with athletic receivers downfield for the big strike. Canada’s Pénélope Robert may not be as well known internationally as Manuela Cardenas, but the display of acrobatic catches and layouts this game should wake people up. In contrast to the contest between the Americans and Dutch, the Pool A game turned messy. Whether because of the poor weather, or because of nerves on both sides, points lasted up to 10 minutes, with multiple turnovers on both sides. From what it looked like, both sides did well when they stuck to their strengths and used short passes to work it forward, but inevitably someone would get excited and boost it deep. In spite of some heroic layouts from Robert and the Colombian receivers, most of these shots ended in turnovers. While the Canadians held a narrow lead through most of the first half, Colombia got the break to pull ahead midway through the second, setting up another dramatic finish. 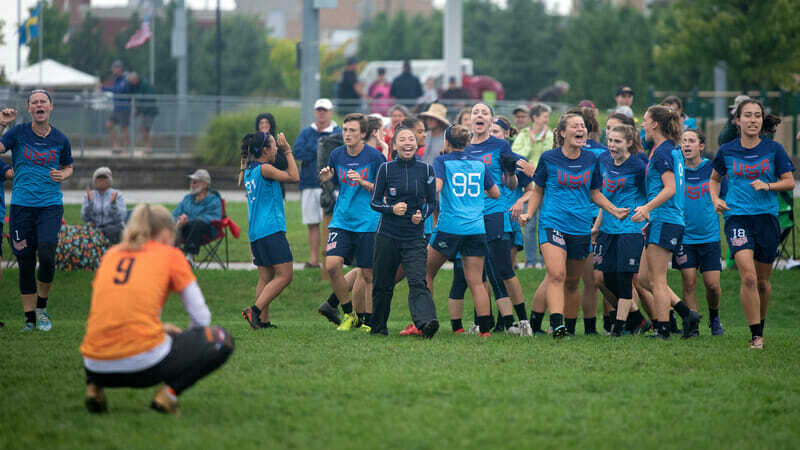 With the rain and increasing wind, at 11-11 Canada came out in a zone, but with an assassin on Manuela, tasked with stopping her especially from getting the disc. Great players rise to the occasion, though, and she is no exception, going almost every other as if the defense wasn’t even there, and working it up to the opposing brick mark. What started to seem inevitable evaporated in a bobbled turnover. In rapid succession, both teams turned it over ten (!) times, mostly on missed throws and catches, until the Colombians managed to put it in to go back up 12-11. Soft cap had gone on during the long point, so it was game to 13. After a deep pull into the back of their end zone, Canada threw into a poach and Colombia quickly converted to win 13-11. Depending on the outcome of power pools, these two teams may see each other in a semifinal, but they’re going to have to clean up their games if they hope to compete with high-powered offenses like the USA or Netherlands. The last important pool game was the Netherlands versus Japan on Wednesday morning. Because of their loss to Italy, Netherlands had to win or drop to the loser’s bracket, and they came out blazing. With Dam and Keulartz poaching deep to stop hucks, Japan’s offense was forced into working its short game in the wind and rain. Too many Japanese misses led to an early Dutch lead, up 4-1. Partway through the first half, though, the Dutch defense faltered. From the sideline, it looked like fatigue was finally catching up with the Dutch stars, understandable given how much they had run again USA. Japan struck quickly while they had the advantage, making a huge run to take half 8-5. Whatever the Dutch said at halftime, they ought to bottle and sell it, because they came roaring back, scoring the next nine points before trading holds to finish. With a 15-9 win, the Dutch secured second place in the pool. An asterisk denotes a team advancing to the power pool determining bracket seeding. 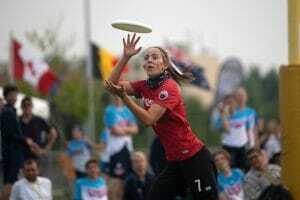 Comments on "WJUC 2018: Pool Play Recap (Girls’ Division)"